Wine bottle shaped cold brew tea bottle. Created from the idea to enjoy cold brewed tea like wine during meals, we designed the wine bottle shaped filter-in bottle. 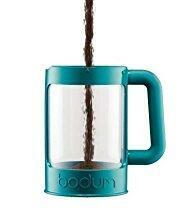 The filter is fixed onto the spout, so you can pour directly. Available in olive green and red. 300ml and 750ml. The simple-to-use Hario V60 Iced Cold Coffee Maker combines the great taste of the V60 pourover brewing method with the refreshing flavour of iced coffee. Simply fill the ice chamber with ice cubes or chipped ice to chill the coffee as it brews. The water distributor's unique design spreads the hot water over the coffee grinds evenly. Includes a package of 10 V60 paper filters. 12 cup capacity | 1.5 Litre | 51 oz. Dishwasher safe and BPA free, the Bodum Bean Cold Brew Ice Coffee Maker comes with two lids: one to seal in your brew as it chills and another lid (with plunger) for when it's time to press and serve your cold brew treat. 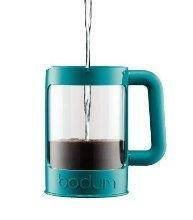 Bodum's innovative locking lid system keeps your coffee cold (or hot) and helps to prevent spills. Cold Brew coffee offers less bitterness (70% less!) and acidity with no cost to flavour. And it's so easy! Mix coffee, coarsely ground, with cold water, refrigerate for 12-15 hours and then press to serve. Brew regular strength or double the recipe to make concentrate (add ice, lots of it). 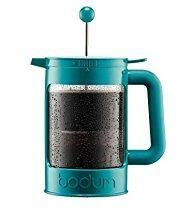 The Bodum Bean Cold Brew Ice Coffee Maker is made from TPE, plastic, silicone and stainless steel and comes in a variety of colours. How to prepare cold brew coffee! Pour in fresh cold water. Bialetti expands into the cold brew segment with this introduction. Submerge the beans for full extraction and twist to stir the grounds to achieve 65% less acidic coffee! 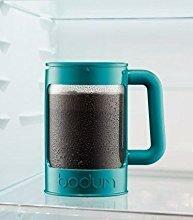 This cold brew coffee maker is compact, portable, easy to adjust, and comes with a stainless steel mesh filter. Cafflano Kompact is one of the most compact café-quality coffee makers on the market. And it packs a lot of brewing muscle into tiny quarters. When not in use, the brewer folds down to a mere 61mm x 108 mm inside a hard carry case to protect your tiny brew boss at all times. The Cafflano Kompact is a coffee maker in the French press style. It features a compression chamber made of durable food-grade silicone that works like an accordion and an easy-to-clean, ultra-fine reusable stainless-steel coffee filter. Use paper filters if you choose to (the Kompact is compatible with AeroPress paper filters - this will produce an even cleaner, softer taste). Weighs 220g and can hold 220ml of liquid. Super easy to clean - empty grounds and rinse. Can make hot coffee, cold brew, and even tea using loose tea leaves. Press down slowly on the chamber to release the liquid over a serving carafe or drinking cup (an AeroPress can only be plunged once, the Cafflano can be squeezed and pressed several times for extra flavour).